On Friday, 30 January the Australian Hearing Hub played host to New South Wales Senator Doug Cameron, the Shadow Minister for Human Services and Nick Champion, the Shadow Parliamentary Secretary for Health who holds the South Australian seat of Wakefield in the House of Representatives. The visit began with a tour of the Macquarie University Speech and Hearing Clinic and meetings with researchers in the ARC Centre of Excellence in Cognition and its Disorders before moving on to Cochlear Limited to meet with senior staff including Dr Chris Roberts and Professor Jim Patrick. The visit also included an opportunity to talk with Chris Rehn, Chief Executive at the Royal Institute for Deaf and Blind Children (RIBDC) and Professor Greg Leigh, Director RIDBC Renwick Centre. They then visited The Shepherd Centre where the parliamentarians were able to spend time with a mother and her seventeen month old daughter who has had Cochlear Implants and is now ahead of her peers in language development. 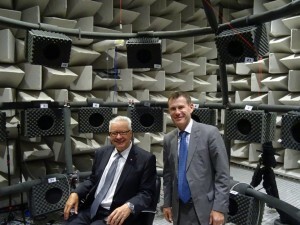 The visit concluded with meetings with staff from Australian Hearing and National Acoustic Laboratories and a spectacular demonstration of the Anechoic Chamber (see picture). 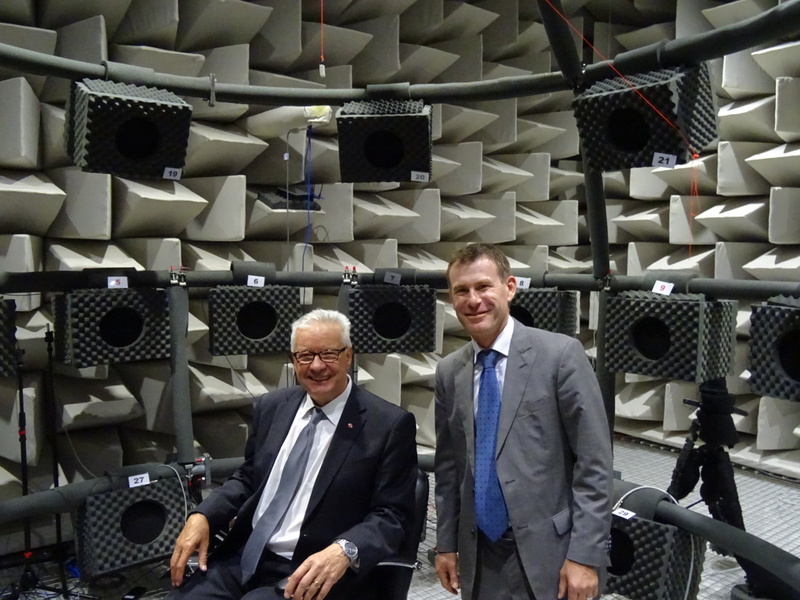 As well as looking at the range of services provided throughout the Australian Hearing Hub, Senator Cameron and Mr Champion were interested in new directions in research such as possible links between hearing loss and dementia. Another topic which came up throughout the visit was how to support the kinds of research projects undertaken in the Hub over the long term, particularly given the intense competition for Australia’s limited research funding. Senator Cameron concluded the visit by thanking everyone involved for their hospitality and saying how impressed he was by what is being achieved here for the community.